Stop me if you’ve heard this one before. Heading into the season, there was little optimism regarding the Phillies playoff hopes. Sure, they had some young players with potential, but there was little to suggest the Nationals would give up their stranglehold on the division. Fast forward a number of weeks, and the Phillies are surprising people. They’ve played well enough that they are 7 games over .500, though they’re still sitting half a game back from first place. Aaron Nola and the rest of the pitching staff are limiting runs with the best of them. People are beginning to wonder – is this it? Is the rebuild over? If you thought I was talking about 2018, you’re only half right. Let me take you back to May 18, 2016. With a 24-17 record, it looked like the rebuild was ahead of schedule – after four grueling years of losing, perhaps this team could finally return to their winning ways. There was one problem – while Aaron Nola, Jerad Eickhoff, and Vince Velasquez were dealing, the offense wasn’t holding up their end of the bargain. The Phillies ranked 29th in runs scored – no pitching can salvage an offense that pitiful. Sure enough, the Phillies collapsed the rest of the way, going 47-74 en route to a 71-91 record. So how is this team different? Unlike the 2016 team, they have the bats to back up the pitching. The Phillies rank 3rd in the NL in runs scored and have allowed the 2nd fewest runs. 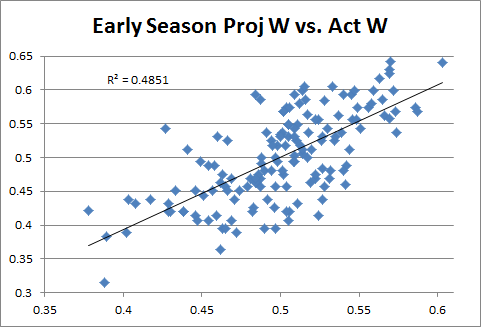 Their .342 xwOBA vs. .302 wOBA suggests they’ve been unlucky – they’ve made solid contact, and if they continue to do so, then better results should follow. To have an offense that isn’t firing on all cylinders but still ranks among the best in the league is encouraging to say the least. Using the wayback machine, I took a look at where the team was on May 23, 2016 (the closest I could get to May 18, 2016) and compared it to where they are now. 2016 was smoke and mirrors. 2018 is the real deal. You might be wondering how much stock you can put into the Fangraphs projections. Right now, Fangraphs projects the Phillies for an 80-82 record, which is an improvement over their preseason projection (but still not postseason-worthy). This has to be low, right? Why so pessimistic when the team has played so well? To test this, I went back through the past five seasons and compared early season projections (about a month in) to the actual end-of-season standings. The results were…somewhat surprising. It means that if things go right this year, the Phillies could see themselves in the Postseason for the first time since 2011. Standout Hitter: Rhys Hoskins. Two homers, four singles, and six walks propelled him to a 1.112 OPS for the week and raised his OPS to 1.076 for the year. He now ranks 6th in baseball in OPS. The two names directly behind him? Mike Trout and Bryce Harper. THE BEAST. Standout Pitcher: Jake Arrieta. Two excellent starts in the span of the week, Arrieta is beginning to look like the top of the rotation starter the Phillies were hoping they’d get. 14 innings pitched and only 1 earned run – that’s some good pitching. Sit-Down Hitter: Nick Williams. Williams had 10 PA in the past week. He walked once, struck out five times, and recorded a grand total of 0 hits. It’s probably no surprise that he was given a couple of days off – it’s hard to find room for a slumping player in a crowded outfield (Hoskins, Altherr, and Herrera combined for an outstanding 1.014 OPS over the past week). He’s athletic and has shown flashes of brilliance. If he wants to do more with his bat, he just needs to swing it less. Sit-Down Pitcher: Vince Velasquez. He wasn’t terrible – but what pitcher would be in a 5-1 week? His only start was an abbreviated one, ended by a line-hugging double that drove in 2 runs for the D-backs. That hit gave Arizona a lead they would not relinquish. Velasquez finished the week with 4.2 IP, 4 ER, 6 K, and 2 BB. It wasn’t awful, but it also wasn’t enough to avoid being named “sit-down pitcher of the week”. Brandon Belt set a new major league record last week with a 21-pitch at-bat. The epic ordeal took nearly 13 minutes. If every at-bat took this long, the average baseball game would take 11 hours and 42 minutes – not including inning breaks. Carlos Gomez hit his first career walk-off home run, and I think he might’ve been excited for it. 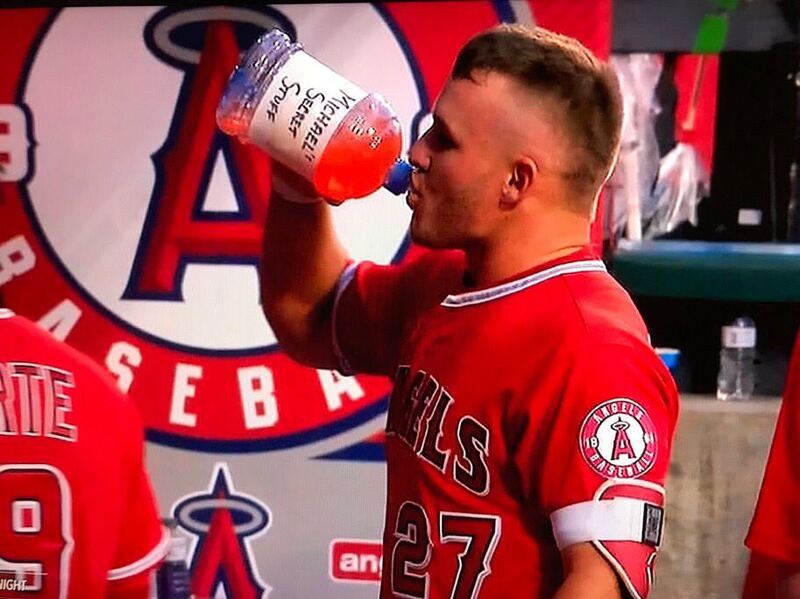 I always knew there was some sort of secret behind Mike Trout’s consistent excellence. Bartolo Colon is the fastest player in baseball. Convince me otherwise. It was brought to my attention from @KleinschmidtJD that Bartolo Colon beat Dee Gordon in a race to first base. It's even better with Titanic music! In the CPBL, Chinatrust Brothers are wearing the best jerseys ever. No word yet on how this will affect pace of play, but it’s a safe bet that all of the powering up will extend each game by at least a few episodes. Sean Manaea of the Oakland Athletics threw the first no-no of 2018. This gives a new meaning to “Beer League”. Mets pitcher Robert Gsellman has accused Noah Syndergaard of stealing his XBox. The confrontation is some high drama. Finally, let’s wrap things up with some good old fashioned “pitchers reacting to defensive plays” gifs. Aren’t they beautiful? Next > Week 5: It was the best of fielders, it was the worst of fielders.